The BV200 is an ideal microphone for the recording, broadcasting,concert halls and stages performace. 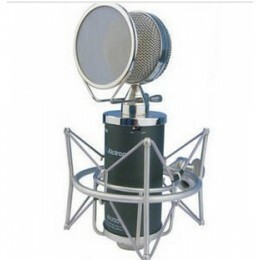 The BV200 Microphone using a low-noise, hand selected 12AT7 tube as well as premium grade capacitors and resistors in order to provide the professional engineer an incredible microphone. The 35mm dual capsule assembly with a 6 micron membrane offers exceptional sensitivity with an open, rich texture.Another unique feature of this microphone is the nice different selectable polar patterns easily available from the selector switch on the front panel popular patterns (Omnidirectional, Cardioid, and Figure Eight pattern) most commonly available, the BV200 has three gradient stages between each pattern. This allows the studio engineer or home recordist far more versatility. * 35mm Large gold dual diaphragm capsule and Vacuum Tube preamp. * Polar pattern: Multi-patterns including Cardioid, Omni, Figure 8 and nine different selectable polar patterns. * Power Requirement: Special power supply.